Through his creative use of forty acronyms, author Ed Gray takes readers on a challenging and insightful 40-day journey of faith development. These acronyms provide readily accessible reference points to principles of faith, which the author develops with both candor and depth. Overcoming temptation, remaining faithful in tough times, and victorious Christian living are some of the topics covered. Includes questions for reflection. "Ed Gray lays out a series of hard-hitting, applicable, and life-changing strategies that can help you reinvent your life and change your condition." Rene Godefroy, author of No Condition is Permanent! From college campuses to state prisons to major corporations, Ed Gray has become a nationally renowned public speaker. The Detroit News described him as "a master at showing people how to get the most out of themselves." In another article, News columnist Betty DeRamus said, "He's poised, polished and people take notes when Ed Gray speaks." The Michigan Chronicle wrote, "He thrills listeners with a wake-you-up delivery and a you will believe message." Former talk show host, Faith Green, said in a newspaper article about Ed Gray, "He's for real. He lives what he states." His clients have included such organizations as Coca Cola USA, Ameritech Capital Corp., Catholic Archdiocese of Lansing, Jackson State Prison, University of West Florida Small Business Development Center, Alabama A&M University, University of Alabama-Huntsville, Michigan State University, Oakland University, Francis Marion University, Elizabeth City State University, Clemson University, Rust College, Detroit public schools and numerous others. Since July 1991, Ed has hosted and written the nationally syndicated radio feature Power Minute. The show is syndicated by Anderson Communications in Atlanta and is heard on more than 80 radio stations across the United States. From July of 1993 until November of 2001, Ed wrote a semi-weekly motivational column in The Detroit News. His other writing credits include a weekly column that appeared in the Michigan Chronicle, Pittsburgh Courier and Flint Enquirer newspapers for several years. 40 Days to a Life of G.O.L.D. 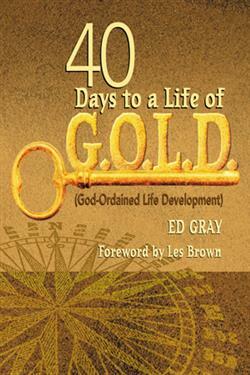 (God-Ordained Life Development) is Ed's first published book.